So the Samsung Galaxy S10 has caught your eye, and you want to reserve a unit as soon as you can. But for one reason or another (perhaps you work for the U.S. government in some capacity) your finances are not exactly at full strength. Well, you could raise some funds by selling your current phone or an older model. One place to go to sell your phone is Gazelle. The company has been around since 2006 and buys previously owned smartphones, tablets and computers. Spotted by Windows Central, Gazelle now has a special offer that will add an extra $20 to the price it pays you for your smartphone as long as it is valued at $200 and up. If you're interested, here is how this works. Go to the Gazelle web site and by following the easy to understand steps, you will get an offer for your phone. If that figure is $200 or more, you're going to see that extra $20 bonus in the price. If you agree to the deal, you will send Gazelle the phone at no cost, and if it matches or exceeds the condition that you said it was in, you will get paid via check, PayPal, or with an Amazon Gift Card. If you were too generous about the condition the phone is in, Gazelle will give you a revised offer, which you can accept or reject. Gazelle also has some automated kiosks where you can sell your phone, tablet or MP3 player. However, the company warns that the price you will get for a device sold in this manner will be lower than the price you get online. Gazelle isn't the only online company that will buy your current or older phone. Trademore will give you an instant quote on your phone, tablet or smartwatch and lock it in for 30 days. You also might want to wait to see what your carrier will give you for your trade. Look, you're not going to get rich by selling your current phone or an older model. For example, including the $20 bonus, a carrier branded Samsung Galaxy S9 fetches only $240 from Gazelle. But when you see a new phone on the horizon that you must own, any funds you receive can help take a little bit of the strain off of your wallet or purse. Extra...? 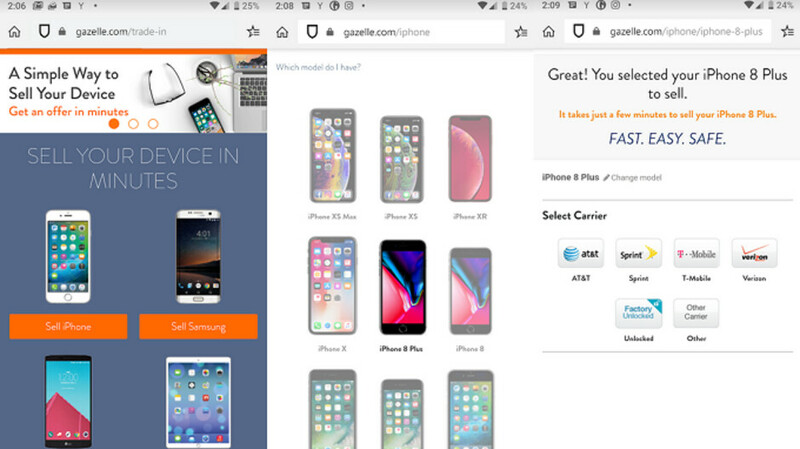 Pixel 3 128 on Gazelle, $370 Pixel 3 from Samsung $550 If you're going to have a sponsored post, at least make sure it's clear that it's sponsored. Since when did advertisements become articles?